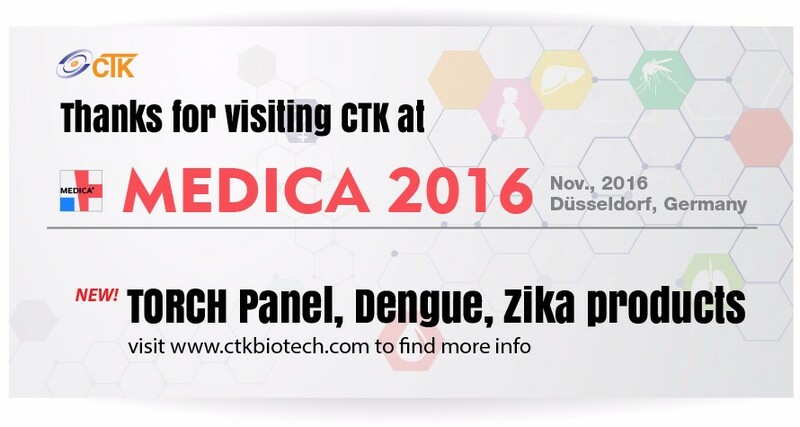 Thank you for taking the time to visit CTK’s booth at Medica 2016! This was a fantastic event for CTK and we hope you enjoyed the forums and conferences. With exhibitors from over 68 nations it was an exciting and busy show. For an interesting look at the colorful world of lab medicine, see this highlight video from Medica 2016. Click here and scroll down to see the video. As discussed, CTK is proud to release many new products to help improve healthcare worldwide. These products include our ToRCH Rapid test panel, Dengue Ag, IgG, IgM ELISA, and new ELISA instruments. These tests and instruments complement our existing large portfolio of easy to use IVD products. Over the coming weeks, we will be following up with additional details. In the meantime, please let us know if you have any questions or would like additional information about CTK’s IVD product offering. ToRCH includes Toxoplasmosis, Rubella, CMV, and HSV-1 & HSV-2. Our unique TORCH panel allows instant screening of infectious diseases that can cause birth defects in a baby if the mother contracts them during pregnancy. Can be used with whole blood, serum or plasma.